Pulldown drying rack. Photo by Brandon Barré. Where can I get a clothes airer like this? 13. Banish the dryingTwo out of five kiwi houses don’t have clothes dryers, and many others don’t like to use them for precious natural fibres. 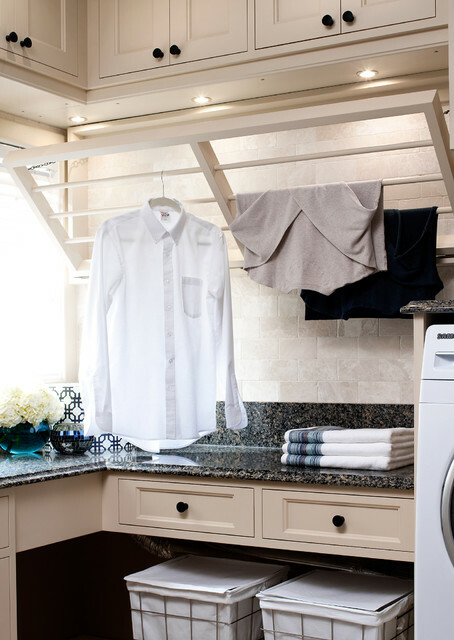 Spare yourself racks of wet washing cluttering up the living spaces by installing an indoor drying rack in the laundry or garage. Look for heated models if you need to get things dry quickly. Return to the foldCollapsible systems like these basic drying and airing racks save space and hassle, and they are a breeze to simply flip down and fold away. In a narrow laundry area they top wrestling with a bulky, uncooperative clothes horse that also takes up floor area. Position one over the tub for drip drying. You’ll rack up energy points by using air power to finish drying clothes.